Do you put hairbows in her hair? Then you probably have a lot of hairbows floating around. Annoying, huh? And it’s pretty simple. And eye catching for any wall. And “The Newton’s” left a comment, wondering if I had any ideas for bow holders. And also, I just remembered that my friend Jodi asked about this a while ago and I spaced it. Sorry Jodi! But she knows I used to sell these a couple of years ago and knew I had this little trick up my sleeve. So here you go! 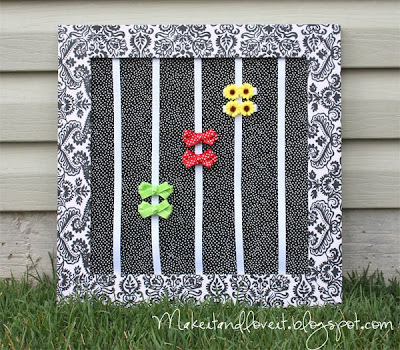 All I did was Mod Podge a frame with some fabric……..just like THIS project (except skip the cork board part). Then I threw the glass away and then I wrapped some fabric around the inner mat like THIS project. If your mat didn’t come with an inner mat, cut a piece of cardboard down to size and wrap your fabric around that. Then I measured out 5 pieces of ribbon that were a little longer than the mat (you can do however many you’d like) and then placed them on top of that fabric covered mat. Adjust how you’d like them and fold each end over the edge of your mat, and hot glue them into place. Do this with each ribbon. You don’t need to make them very tight because then you won’t be able to slide your clips under the ribbon. But you don’t want it too loose either, or your clips will flop around. Got it so far? Okay, now you’ll place this part back into your dry-mod-podged-with-fabric-frame and then secure your backing into place. Turn back around, and you’re set. Congrats……you did it. Not too difficult, right? Now hang on a bathroom/bedroom wall or set on a bathroom counter. Enjoy the clutter-free space on your bathroom counters now. Thanks Ash! This is going to make my bathroom TONS more organized. I think I will go to the store right now and get the stuff!!! All 3 ideas are awesome! I’m in the middle of doing the cork board! I LOVE that! I’m so excited to make one! Great idea. I can’t wait to try it myself. That’s a great idea. I have been sellingbow holders that are a bit similar to these but I use canvas boards and cover with fabric. I like the frame around it though. Oh I absolutly LOVE you!!!! I swear you read my mind sometimes…my bows and clips are up on a shelf in a big huge pile…all messy! Thank you so much for posting this…. I have been trying to find something like this that I can do that I love, and you have just solved the problem. Thanks! I have seen a few bow holder tutorials around blog-land, hehe but none I have seen are as cute as this!! :) If I had a little girl you better believe I would be making this ASAP! I will keep it in mind for the future or for gifts though! So cute! I have only seen the ones where you make it out of a hanger though, and wasn’t really feelin those. So, THANK YOU THANK YOU for giving me a much prettier way to fix my dilema!!! I can’t wait to make one of these!! I am sure I already have the fabric (I’m a fabricaholic), so now off to the store to get the frame and goop! LOVE IT! I have recently been looking for an idea to clip my bows to! This is MUCH better then what I came up with….thanks! Okay. Duh…I just read your FAQs, which answered my own question. So we just can’t use YOUR tutorials to make things to sell. Okay! ‘Cause my daughter had already made some of the things before she saw your tutorials. Thanks, and feel free to clarify if you need to. Lacey, that’s actually a great idea. It would help with the headband problem too. Noodle – Right, the tutorials are not to be used to make things to sell. But by all means, I don’t own the idea itself, so if you have your own patterns and stuff……of course. Sell it!! And good luck. It’s a fun way to earn some extra money. Great idea! Very cute. Love your blog. did you use regular mod podge or mod podge for fabric? Omigosh, I was seriously just thinking today of making some kind of ribbon thing that I could suction cup to the bathroom mirror for my daughters barrettes, when her dad takes them out he leaves them in the bathroom, and they are tiny little things since she is only 7 months old. What a great idea and it will look so nice in the bathroom too! I’m totally doing this! Thanks again for another great idea! You know Anna, I honestly didn’t know that there was a fabric mod podge. Whoops!! :) So I’m thinking I have just the regular kind. Rose, how funny! Hope you love it in your bathroom. And baby food jars…..hmmmmmm, I might have to think about that one for a while. I’ll let you know if something comes to mind. I was just wondering where you found the frame? I found the frame at a craft store called Roberts. It was just raw frame, no paint, no finish, and no glass. It was pretty inexpensive this way. I’m thinking it was $6 or so. I am soooooooooo excited about making this! Thanks! I'll be linking to this from myskinnypurse.blogspot.com as a tutorial. I did one, but it turned out a little different…a little variation. Thanks for the great idea! Hi – I just made this and linked back to you on my blog with pictures. Thanks again for another great tutorial!!! Just made one of these and am so happy with how it turned out! Thanks! Ok… I hope you still read these comments! I JUST found your blog and I am LOVING IT!!! This project especially! I wear hair bows in my hair and can NEVER find the one I want. This will help in a huge way! Super cute! Love the black and white. I just made some using the picture with a ribbon hanging off style. I was planning on blogging about it next week but maybe I'll make one of these first and then blog about the two different kinds. Love it! I think I'll use some slightly elastic ribbon to adjust for slack and avoid flappiness. I am enjoying all your project so much, keep 'em coming!!! – Such a big fan! Love this! I'm making bows for my grand daughters and this will be perfect to "finish" them off!